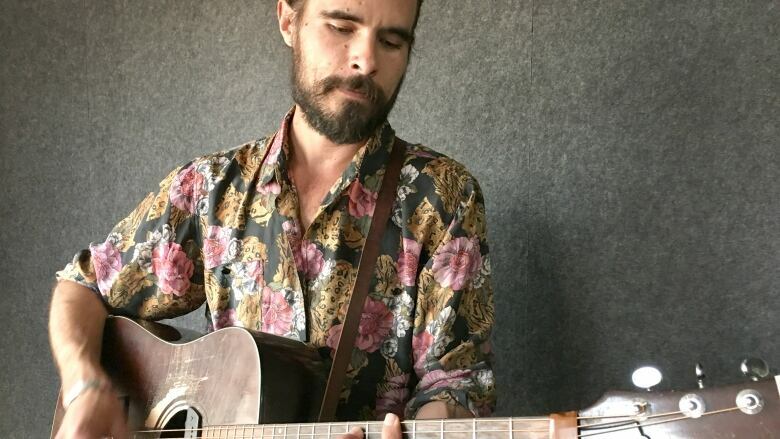 The Calgary band Reuben and the Dark is reminding travellers of the dangers of winter driving after their van and trailer rolled off the Trans-Canada Highway near Banff National Park. Band's van and trailer rolled off Trans-Canada Highway near Field, B.C. Reuben and the Dark posted an account of their harrowing highway crash near Field, B.C., after they left Vancouver for Toronto last week. It includes an Instagram image of an overturned van and trailer lying by the side of a dark road. Lead singer Reuben Bullock says no one was badly hurt but their vehicles were "totalled" Friday night. He says the trailer broke open, sending gear across the road and damaging irreplaceable instruments, including his guitar. Bullock was in Toronto at the time — he and bandmates Shea Alain and Dino Soares flew to their next tour stop while bass player Ian Jarvis drove alongside passengers Brock Geiger, the band's guitarist, and Kris Harper, a member of their opening band, nehiyawak. Bullock says the trio were trapped in the van for a few minutes until rescuers could remove the windshield. Jarvis escaped unscathed but his two passengers suffered minor injuries. Bullock says no other vehicles were involved. Bullock says his bandmates were slated to fly to Toronto on Tuesday for a performance Wednesday and another show Saturday in Montreal. "We're super lucky that we're not dealing with anything more serious," Bullock said Tuesday by phone in Toronto, where he's now based. "Something like this is always in the back of your mind for sure.... Now I'm finding out what I really have insurance for. Before you kind of just check a couple of boxes and don't think about it but now it's going to change a lot of things in how I prepare for this." He said it had snowed the day before. His bandmates headed out at about 9 a.m. that morning, hoping to reach Calgary by end of day. They veered off a portion of the Trans-Canada Highway that luckily had a shoulder instead of a ditch, he says. "The rescue crew had to cut the windshield out of the van to get them out," said Bullock, adding that the trio were taken to hospital in Golden, B.C. "Kris tore something in his shoulder, Brock had a pretty good concussion and some pretty serious whiplash. He's kind of waiting on a CT scan still but he's actually flying out for the show, which is pretty crazy. And then Ian, the driver, he's apparently completely fine." The crash capped a trouble-plagued tour that included a failed transmission about five days earlier in the middle of a stretch between Calgary and Saskatoon, said Bullock. Then, a band member missed the gig in Winnipeg, forcing Bullock's wife to fly in as substitute. When they reached Victoria, they noticed the tire treads on their brand new trailer had completely worn out. "It's kind of been one of those tours that really tests everybody. But the audience and the reception and all of the shows every night have been so, so amazing that ... I still look at this whole tour as being the best tour we've been in. But it's definitely been the hardest." Bullock says he has insurance on the van, trailer and instruments. But there have been several out-of-pocket expenses, including the cost of the ambulance, tow truck, shipping the equipment, flying band members to Toronto, and renting a new vehicle for their show in Montreal. In the meantime, Bullock is hitting up friends to try to pull together enough equipment to play the final two shows of this leg. In December, they head to Ireland but plans are afoot for another road trip through Ontario and Quebec in typically snowy February and March. "Vehicle to be determined," says Bullock.